The iPad 2 came out this month! 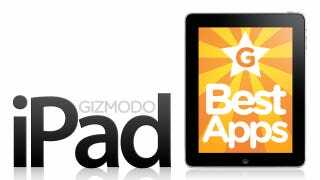 Which means a lot of apps have joined our list of the best iPad apps. Who are the big winners in March? Who gets the boot? CNN: There's so much going on the world right now that I keep my eyes glued and fingers pressed to the CNN app on the iPad. There's breaking news, top stories and the clincher, at least for me, great videos of everything CNN covers. Free. Friendly: Friendly is the best unofficial Facebook app on the iPad because it does everything you'd want the non-existant official Facebook app to do: browse photos, make wall updates, check your profile, like and even chat. Free or $1. PhotoSync: With PhotoSync, you don't have to plug in your iPad to transfer photos and videos to and from your computer. It transfers your photos and videos wirelessly and is plenty fast. You could even swap photos from your iPhone to iPad too. $2. iA Writer: Very possibly the best and most elegant text editor on the iPad. The typography is stellar, the interface is perfect for just writing as there's no distracting autocorrection or scroll bars. There's an added row for arrow keys and even a focus mode blurs everything but the three lines you're working on. Syncs with Dropbox too. $1. Superbrothers: Sword & Sworcery EP : A game that's an epic experience. One part 8-bit graphics, one part beautiful original music, one part adventure, and one part RPG combine for a game that's essentially about exploring and brings your childlike wonder back. $5. LogMeIn Ignition: It's the best VNC app on the iPad. LogMeIn Ignition gives you pretty much control of your PC/Mac through your iPad. It's speedy, refreshed with a clean UI, and lets you wake your computer up from anywhere in the world. $30. iMovie: iMovie on the iPad is great for on-the-go movie editing. There's support for gestures, an updated UI, templates and fully customizable transitions. Not to mention multitrack audio recording, Airplay compatibility and the ability to export movies in HD. $5. GarageBand: GarageBand for iPad is a no brainer for any budding musician. It offers 8 track recording, over 250 loops, and is fully compatible with the Mac version of GB. You get a load of virtual touch instruments too and if you want, you can plug in your guitar and use the virtual amps. $5. Zite: It's a personal magazine app that customizes its content just for you. It learns what you like from your Google Reader and Twitter account and displays stories you'd probably ejoy reading. The app gets bette the more you use it, as it becomes more familiar with your tendencies. Free. TWCable TV: Luckily, if you're unlucky enough to deal with Time Warner as our cable and internet provider, you get an iPad app that streams 32 channels of Live TV...for free. It basically adds another TV to your house littered with channels of ABC Family, BET, Comedy Central, MTV, and others when you're on your home Wi-Fi. Free. NBA Game Time Courtside: The only app you need if you love basketball. It gives you video highlights, player stats, box scores, play by play reports and if you have NBA League Pass, you get to stream live NBA games too. Free. Battleheart: RPGs are intimidating! But Battleheart is adorable and addictive with delicious graphics and a control scheme designed around poking, prodding, and swiping. You control four characters and go on your RPG quest. $3. Atomic Web Browser: The Safari browser is great but the Atomic Web Browser actually supports tabbed browsing which makes juggling multiple websites so much easier. It can also do full screen browsing and offers a load of other features. $1. Penultimate: Penultimate is a scratchpad for your iPad where you can handwrite quick notes with your finger. It's as useful as using a pen and pad but so much slicker. You can print or e-mail your handwritten notes too. $2. None! But we're comin' with an axe next month.